Flucloxacillin 500 mg 40 caps. What is Flucloxacillin used for? Flucloxacillin is a penicillin antibiotic. The active ingredient flucloxacillin kills certain bacteria. By doing so, it cures bacterial infections and provides relief from symptoms such as pain, fever, swelling, redness of the skin and other inflammatory responses. Flucloxacillin is a prescription-only medicine. Skin infections such as erysipelas, impetigo, infected eczema and boils. Flucloxacillin is absorbed in the bloodstream via the intestines and deposited in the infected tissue. A course of Flucloxacillin will usually clear the infection within a few days. Flucloxacillin capsules should be swallowed whole with a glass of water. This medicine should be taken on an empty stomach one hour before or two hours after food. This is because food will reduce its effectiveness. It is important that you finish the entire course, even if you feel better. Stopping the course early increases the chance that the infection will come back and that the bacteria will grow resistant to the antibiotic. Strength, daily dose and duration of treatment should be determined by a doctor depending on your symptoms. 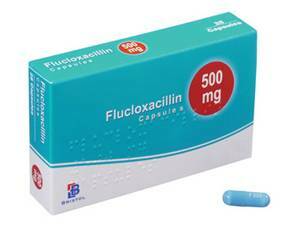 In general, Flucloxacillin is given as a 5- to 10-day course. Adults and children aged 12 and above: one 500-mg capsule, three times a day. Children aged 6 to 12: one 250-mg capsule, three times a day. Flucloxacillin capsules should not be used in children under the age of six. Always follow the prescription exactly - never use more or less than the doctor recommends. Read the package leaflet before use. Skin rash, sometimes due to allergic reaction. Consult a doctor if you experience this side effect. For a complete list of possible side effects, see the package leaflet. You have a liver condition or history of liver problems. Consult a doctor on the use of Flucloxacillin if you have a health condition that is not listed above. Flucloxacillin interacts with other medicines, including certain anticoagulants. It is therefore important to tell the doctor what other medicines you are taking when you order, so that he/she can check if the combination is safe. Do not use Flucloxacillin if you are pregnant or planning to conceive without consulting a doctor first. Flucloxacillin can be used safely while breastfeeding. Flucloxacillin does not interact with alcohol or affect your ability to drive.